NASA's Cloudsat (upper left) and Calipso weather satellites show in this artist's rendition are set to launch into orbit next month. Aftermonths of delays, NASA is once again set to launch a pair of cloud-watchingsatellites to join a flotilla of probes aimed at improving weather and climateforecasts. A Boeing-builtDelta 2 rocket is due to launch NASA's CloudSat and CALIPSO satellites at6:02:08 a.m. EDT (1002:08 GMT) on Friday in an early-morning space shot fromVandenberg Air Force Base in California. "I know Ispeak for the entire team when I say it's been a long road," NASA's CloudSatproject manager Kevin Brown, of the agency's Langley Research Center, in aWednesday press briefing. Originallydelayed from a summer 2005 launch, CloudSat and CALIPSO were also unable tolift off last November due a labor strikeby Boeing's aerospace workers. That strike ended inFebruary 2006. Now the twoprobes are set to join three others already in orbit and generate the firstcomprehensive, three-dimensional (3-D) views of Earth's clouds and extremelyfine particles called aerosols. The data will not only aid weather studies, butalso help researchers understand the impact humans have on Earth's climate andtheir contribution to global warming, mission scientists said. "Thesesatellite missions are experimental missions, they're firsts," said Hal Maring,NASA's CloudSat and CALIPSO program scientist at the agency's Washington D.C.headquarters, during the briefing. "If these missions are successful, as Ibelieve they will be, they could be the foreshadowing of operations or routinemeasurements that could come later." 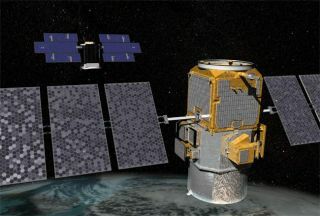 At theheart of the CloudSat and CALIPSO is their ability to generate 3-D views ofEarth's cloud and aerosols, where past spacecraft have made primarilytwo-dimensional observations. ForCloudSat, a $185 million mission aboard a 1,870-pound (894-kilogram) satellite,that capability is centered on a powerful radar designed not only to build a3-D map of cloud cover, but also identify specific particles of clouds, rainand snow to pinpoint how water is globally distributed in the Earth'satmosphere. "TheCloudSat radar will be about 1,000 times more sensitive than your regularradar," said David Hudak, a mission research scientist with the Science andTechnology Branch of Environment Canada, during the briefing. GraemeStephens, CloudSat's principal investigator at Colorado State University inFort Collins, said the satellite will allow scientists to quantify the contributionof cloud cover to the global greenhouse effect and make fundamentalobservations into the Earth's water cycle. "We haven'tseen Earth like this before," Stephens said. "There's going to be muchdiscovery to come from thee new missions." WhereCloudSat has a radar, CALIPSO has a laser. Short forthe hefty title Cloud-Aerosol Lidar and Infrared Pathfinder SatelliteObservations, CALIPSO uses a laser ranging instrument - or lidar - to measurethe levels and characteristics of aerosols in Earth's atmosphere. The $223million CALIPSO mission is a joint effort between NASA and the French Space Agency(CNES) featuring a 1,294-pound (587-kilogram) spacecraft that carries threeprimary instruments. In addition to the lidar, the satellite is equipped awide-field visible light camera and an imaging infrared radiometer to study theatmosphere's aerosol content. "In manyways, clouds and aerosols...affect and in some way even control climate, weatherclimate, the air we breathe and the water we drink," Maring said. Variationsin the amount of natural and human-made aerosols in the Earth's atmosphere canaffect temperatures and contribute to the greenhouse effect and global warming,researchers said. "It's veryimportant to know what the human impact on the aerosol content is," saidJacques Pelon, CALIPSO co-principal investigator at France's Institute PierreSimon Laplace, during the briefing. CloudSatand CALIPSO are relative latecomers to a series of Earth watching satellitesworking together to build a comprehensive picture of the planet's weather andclimate. Scientistshave dubbed the spacecraft group the 'Afternoon Train' - or 'A Train' - sinceit crosses the equator during the early afternoon. All of the satellites areaimed at an orbit 438 miles (705 kilometers) above Earth. First inthe group is NASA's water-watching Aqua satellite launchedin May 2002, which was followed by the space agency's Auraspacecraft in July 2004. A third satellite, France's PARASOL spacecraftstudying the microphysical properties of clouds and aerosols, launchedin December 2002. "The valueof this combined set of measurements gives us hope to be able to constrain theEarth's system...to the point of being able to predict it," Maring said. "Andprediction is terribly important."